Understand how schema markup works and why it’s important. Use the right plugins so schema markup is added to your blog. Let’s start with that first part, understanding how schema works and why it’s important. I think it’s easiest to understand the concept by pretending that you and I are sitting across from each other at a coffee shop (if you really want to paint the picture, I’d be drinking an Earl Grey Tea Latte). Instead of just talking at you (i.e. the equivalent of writing really long paragraphs about schema markup), I’ll do my best to talk with you. I’ll do this by providing short, simple answers to questions that you might be asking yourself about recipe schema markup and how it impacts your food blog. How’s the Earl Gray Tea Latte? Super yummy. Thanks for asking. Bjork, do you mind if I ask you a few questions about schema? Sounds like fun! I love talking about schema markup. What are your questions? Schema markup is a type of code you add to your website, but I like to think of it as an interpreter between you and search engines. Let’s say that you have the word “chocolate” in one of your recipes. Without an “interpreter,” Google isn’t smart enough to know if you’re talking about (a) an ingredient in your recipe or (b) the 2008 movie about an autistic girl with powerful martial art skills who settles her ailing mother’s debts by seeking out the ruthless gangs that owe her family money. Yes, that movie description is for real, and yes, the movie is called Chocolate. That’s why we need schema markup. Schema markup acts as an interpreter between the content on your blog and a search engine. When using schema markup, you just add a little piece of code to the word “chocolate” so Google knows that you’re talking about chocolate the ingredient, not the movie. That looks kind of complicated. Will I need to know how to code that? Nope. Not if you use the right plugins. This post is just about understanding what schema markup is and how it’s used, not learning how to code it. Who created this darned thing? The folks behind Google, Bing, Yahoo!, and Yandex (a Russian search engine) teamed up to create the Schema.org community, which helps to “create, maintain, and promote schemas for structured data on the Internet.” You can read more about it at schema.org. There are a few different types of schema markup including Microdata, RDFa, and JSON-LD. Okay, so which schema markup should I use? Yeah, good question. Right now, the recommended schema markup is called JSON-LD. You can read a bit more about it here, but it’s the preferred schema markup for search engines like Google and Pinterest. So what’s in it for the search engines? The goal of a search engine is to provide really helpful, quality search results to their users. Schema markup helps them accomplish this goal by making it easier for them to show results that have additional (i.e. helpful) information. Ah, yes. The million dollar question! Using schema markup on your site increases the chances that search engines will show rich snippets for your site, which increases the CTR for search results (CTR stands for “Click Through Rate”). In other words, using schema markup on your site increases the chances that your blog’s search results will include more interesting information (like a photo, a rating, or ingredients information), which in turn means that more people will click on that link. While having schema markup on your page doesn’t directly impact your search ranking, the CTR from searches does impact your ranking. When a user clicks on a search result and stays on that page (i.e. they don’t immediately go back to the search results page), that’s a signal that the search result matched the query. Google and other search engines care very much aout matching the user’s query, so when your page matches the query, well, your page is more likely to rank well. Another cool thing about schema markup is that other websites can use it to add functionality to their site. Why did you emphasize the words “increases the chances” in that last answer? It’s important to know that using schema markup doesn’t guarantee that search engines will use that information to enhance your content in search results, it only increases the chance that they’ll use it. What’s an example of a website that uses schema markup to add functionality? If you’re a food blogger than you’re probably familiar with Rich Pins for Recipes. 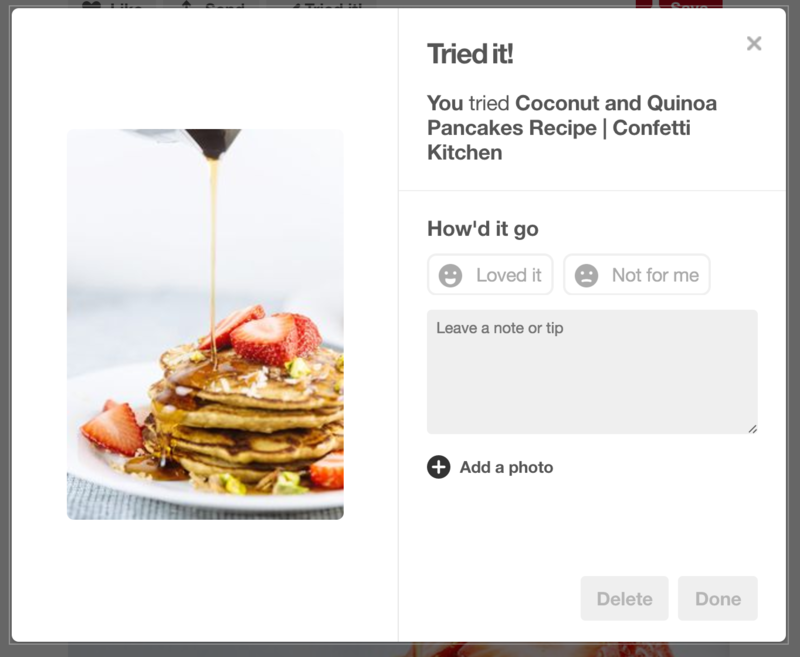 With Rich Pins, Pinterest uses your blog’s schema markup to pull in additional information about your recipe and displays that information with the pin. Will using schema markup help my blog posts show up higher in search results? Not necessarily. That’s what Google says at least. If you watch this video from Google you’ll see that their answer to this question isn’t a “hard no,” but it’s definitely not a “yes” either. Why should I use schema markup if it doesn’t help my site show up higher in Google? See question “So what’s in it for me?”. Okay…I get the gist of it. Hit me with the hard stuff! Can you show me some schema in action? Take a look at this quick video FBP team member, Alexa, put together showing you an example of schema in action on a Pinch of Yum recipe post. Awesome! So I get what recipe schema is. How do I add it to my blog though? As I mentioned before, the good news for food bloggers is that there are plugins that will help you automatically add schema markup to your blog. Tasty Recipes: First and foremost…the recipe plugin that we built! It’s a lightweight premium plugin that makes it easy to add recipes to your post with the schema markup (JSON-LD) that makes search engines happy. WP Recipe Maker: Another super solid recipe plugin with a free and premium option. If you’re a member, you can find some additional information about choosing the right recipe plugin for you in the Essential Plugins forum or in the Understanding Recipe Plugins course. If you’re not a member, email your plugin developer to see which markup is used within your plugin. Yep. There’s lots of other cool stuff you can do with schema markup, but for a food blogger the important thing is using one of these plugins. This will ensure that schema markup is automatically added to your recipes and that the schema markup is compliant with Google. How do you pronounce schema? How do your pronounce Bjork? Thanks for sharing this virtual coffee conversation with me. 🙂 If you have any other questions hop on over to the community forum or leave a comment below. Great post! I just got approved for rich pins on Pinterest and they’re a real game changer. Thanks to you I’ve been using Easy Recipe since I started my blog one year ago, so glad I listened :)! Thanks Alexe. Congrats on getting rich pins implemented! Awesome post and video! Still no plugins or way to do this with Blogger, right? I want to switch to WordPress but don’t think I can get it done until 2015 at the earliest. I use the Easy Recipe plugin, but I don’t seem to have schema markup. Is it because I don’t have the premium version of Easy Recipe? Is there something else I need to do or add to have schema markup? There shouldn’t be! Could you post a link to an example page on your blog? I just checked out your page and it looks good to me (see attached)! What part did you think was missing? Easy Recipe doesn’t let you upload a picture unless you upgrade to plus. I’m guessing this is why yours (and mine) don’t look the same as Bjork’s in search results–because there is no picture. I must admit I was looking forward to uploading an awesome new plugin (especially after getting through all of this with lots of kid voices around and [i think] understanding it). But, it’s nice to know I am already using this schema thing. Haha! We use Disqus for commenting on the blog: https://disqus.com/ Is that what you mean? I thought there was a way to comment just from the foodbloggerpro account, but it looks like I was confused. You’re right Debra! We used to have the commenting system tied into FBP accounts, but we changed over to Disqus a few months ago. That is great information thanks so much for keeping us in the know! How relieved was I to see that I was already using ziplist. But good to know as I am revising my site and was considering whether or not to keep it. Whew! I just want to say thank your so much for your information. I teach cooking but I have little idea of blogging and photography (especially technical). Somehow I found you and Lindsay, thanks God! I bought Lindsay’s tasty-food-photography a month ago (I haven’t said thanks to her yet, for sure will). But this easy recipe formatting that I have been looking for so long, finally I got the answer! Thanks again Bjork! You and Lindsay are awesome people! I still have a lot of things to learn and a lot of things don’t understand…but at least I found a home to look at. Many thanks! Wow! So nice. 🙂 Thanks so much for the kind words. Made my day! How do I add schema to my homepage? Like how you guys have recipes, income reports and 4 of your recipes. Sorry I should have included a screen shot from the get go! But do you see how pinch of yum has several links below your usual title text? This is great to see summarized. I have a question, though: I’ve been using Ziplist, and it seems to work fine. Yet rich snippets never seem to show up in search results. Are there other steps one needs to take, or is it just luck of the google draw? Bjork – I love how simple this post is, the question/answer format is really a smart way to explain things. I read a couple of other bloggers and your format is always so warm and inviting. Thank you for sharing this great information. I use the Recipe Card plugin, and like it. When I do a manual check for schema, it’s in the code, but the photos and schema are not showing up in Google searches. I first noticed this just today after reading your rich pins post, It doesn’t validate with Pinterest. I’ve also noticed my site loading REALLY slowly for the last few days, and although I’ve been tweaking things, it doesn’t seem to help. Still working on that. That’s the important one to check for rich snippets and structured data. I’m currently using Quick Cache, but have used the Yoast one, and may go back to it. Honestly, I checked site with google webmaster, it comes up, but not sure what I’m really looking for. Nothing mentioned recipes, that’s for sure. Do you mean W3 Total Cache? I don’t think Yoast makes a caching plugin, but he recommends W3 Total Cache. Have you looked into synchronous vs asynchronous loading for your ads? That might help! Cool thanks Bjork! Do you still recommend Easy Recipe?? I have Easy Recipe Plus. Is that still ok? Brilliant Post Bjork, thank you very much! I have a question if somebody could answer here- I have recently started using Meal Planner Pro plugin for my recipes but the ingredient list still doesnt come up on Pinterest. Is it because I am not using the Pro version? Hi Bjork, I have a quick question for you. I am currently in the process of moving my site from Wix to Worpdress with hopes of monetizing it in the long run. I am almost done moving all of the recipes over, but I have not been using a recipe schema so far (I’m worried now!). I looked into some of the plugins and didn’t find many designs that I liked. I really want to keep my recipe layout clean and without boarders and such. Do you recommend any? Could I ask which plugin Pinch of Yum uses? And is it a possibility not to use a plugin and just add the specific coding you you mention in the video? Thank you for your time, and I look forward to the opportunity of becoming a member of food blogger pro. Also, I am thinking of you and Lindsay during this challenging time. You all have a lot of people thinking about you! Hi Lauren! Just jumping in for Bjork here. That’s a great idea to move from Wix to WordPress. It’ll be a pain right now, but so worth it in the long run! Getting your recipes set up correctly from the get-go is super important. They are, after all, what will bring readers to your site. The schema markup can’t really be done individually – it’s something that is generated when the page loads and that would take a TON of time to hand-code for each recipe. It’s definitely worth it to use a plugin. Tasty Recipes does exactly that – it inherits styles without applying any borders or anything. You can see an example of how it looks right out-of-the-box on one of our customer’s websites here: http://hilahcooking.com/wor…. Pinch of Yum is currently transferring over to Tasty Recipes, but for POY the plugin is styled a bit more than what you may be looking for. If you join the waiting list, we’ll contact you when we go public with the plugin in a couple months – or maybe even before. Let me know if you have any other questions! Thanks for this post! Where do the reviews / ratings actually come from? I don’t have a place on my site for people to leave a star rating, and when I search for some of my recipe, the link is back to Pinterest and includes a star rating. Thanks Bjork! I’m not using a plugin with a rating system though – so that’s why I was confused. It looks like Pinterest might be adding ratings to recipe rich pins? Hoping this question will be helpful to others who might be noticing the same thing. And then Pinterest uses either a 5 (for Loved it) or 1 (for Not for me). In this case there are two 5s and one 1. Ah! Thank you *so* much. This definitely explains it!